WASHINGTON (CNS) — People had been on edge for a while. You could feel the tension rise in immigrant neighborhoods in the U.S. as news of the first immigration raids under the Trump administration began in early February. Then news of unusual detentions, some involving battered women and students who had been protected under previous policies, set off panic. A variety of communities, from the Irish to Latinos, worry that the roundups mark the beginning of what President Donald Trump promised in his campaign for the presidency: to deport the country’s estimated 11 million unauthorized immigrants. Responding to the fears, Spanish-language television network Telemundo hosted a prime-time show Feb. 12: “Immigration, Trump and Hispanics.” The show featured activists, lawyers, children of deported parents and relatives, along with advice about what to do if government officials come knocking. 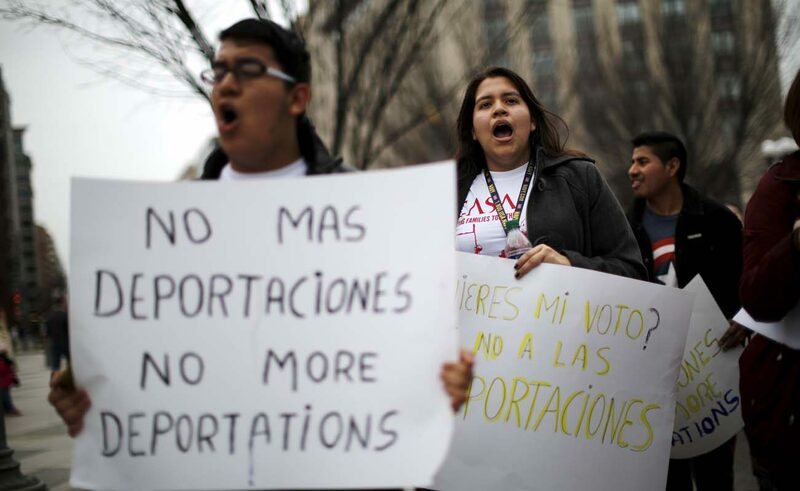 The publication IrishCentral almost daily has been posting stories about raids in Latino communities sprinkled with some assurances, but also a few worries about the immigration status of some 50,000 unauthorized Irish immigrants in the U.S. But later, Trump said they were part of a new effort. About 75 percent of those arrested in the raids near Los Angeles, Chicago, Atlanta, San Antonio and New York City, the agency said, had been convicted of crimes, but it did not say who made up the other 25 percent. Some worry that it included students and women who had previously been protected from deportation through programs such as the Deferred Action for Childhood Arrivals, known as DACA, and the Violence Against Women Act, which protects victims of domestic violence and sexual assault. In a wide-ranging Feb. 16 news conference after announcing his pick for labor secretary, Trump talked about a “crackdown on sanctuary cities,” said a “nationwide effort to remove criminal aliens” had begun, and that he had ordered an end to the “catch and release policy” that allowed unauthorized immigrants caught by officials to go free while they await a hearing. He also announced the creation of “a new office in Homeland Security dedicated to the forgotten American victims of illegal immigrant violence, of which there are many,” he said. The announcement came just a day after Catholic bishops whose dioceses are on the U.S.-Mexico border met Feb. 13-15 in Texas in the Diocese of Brownsville. They visited an immigration detention center as well as a church-run facility that helps migrants. All of this came in a week of incidents carrying the narrative that no one is safe from deportation. In Alexandria, Virginia, the pastor of a church denounced actions of ICE agents who arrested in mid-February a group of homeless men leaving a hypothermia shelter his church operates. In Seattle, a 23-year-old with no criminal record and protected by the DACA program was detained Feb. 10. In early February in Texas, ICE agents showed up to a protection order hearing and arrested a woman who was about to testify against her alleged abuser. Univision Las Vegas reported that immigrants, fearing raids, are afraid to go to church. ICE reportedly canceled a meeting with the Congressional Hispanic Caucus as the lawmakers were trying to find answers to the incidents. While all of them involve Latinos, other immigrant groups are expressing on social media anxiety in their communities. Some of it was manifested as Trump spoke of them by those who took to the streets in “A Day Without Immigrants” protests against the immigration measures he has proposed and his promise to build a wall between the U.S. and Mexico. Sister Norma Pimentel, a member of the Missionaries of Jesus, who is executive director of Catholic Charities of the Rio Grande Valley in the Brownsville Diocese, said during a Feb. 15 town hall that those who work along the border had started seeing that something was different. One of the centers that helps migrants had been seeing about 300 to 350 people a day seeking shelter and food after being released by immigration officials. Now they see between 50 and 75 a day, she said. Sister Pimentel, along with Jesuit Father James Martin, participated in the town hall as part of the “Build Bridges, not Walls” campaign sponsored by the Washington-based Faith in Public Life. The campaign is taking place Feb. 17-24 and asks those wishing to support immigrants and refugees to organize prayer events, call their local politicians, attend town halls and educate others about the plight of migrants during the campaign. Compassion and forgiveness form the very essence of what it means to be Christian and Catholic. Agreed. Using labels like “immigrants” and “migrant families” to describe persons coming into our country “Illegally” is deceptive language that undermines the legitimacy of any sovereign country founded on just laws and clearly defined rules regarding legal entry and legal citizenship. Can we say the truth of what we’re discussing… “illegal immigration”? America was founded as “one nation under God” with God-given laws that pertain to all citizens. Granted too that all our laws are not just- like abortion. But to suggest that it is somehow a noble Christian undertaking to allow unfettered entry to everyone and anyone who wants to come into America of their own will and to allow them to circumvent the legal immigration laws of our country is just plain wrong. Romans 13 exhorts us to obey the laws of the land and those whom God has placed in civil authority. Until the day comes when those who propose open, uncontrolled borders will leave the doors of their own homes open and unlocked and allow anyone and everyone to enter their personal domains, then I will listen. That day has certainly not yet come. Build bridges…. sure, but build them with gates made of just laws and guard them with care and concern for the people- and children- who now live here legally.